Yes, I know it’s January 3, and all the New Year’s posts are supposed to be over now, and we’re all supposed to start failing on our resolutions. But I’m a little behind on blogging, so I’m posting my “Welcome, 2014!” post now. I never know what to do for the New Year. I’m not a fan of resolutions, really. I usually set some goals for myself, at least, but this year, I wasn’t feeling that either. The thing is, I have some big goals, professionally, personally, and running-ly, (most of them are listed among my Thirty Before Thirty goals), and they will likely take more than a year to accomplish. So I didn’t really want to set specific 2014 goals. Then, I saw several posts in which the blogger chose a focus word for 2014. Instead of making resolutions or making goals, their goals were to try to make their life in 2014 reflect those words — words like joy, perspective, fearless, balance, etc. I liked that idea. A lot. But as I thought about my 2014 word, I found myself coming back to two: “passion” and “pursue.” I liked pursue because that’s what I want to do: actively pursue those big goals. But I also liked passion because those big goals are in the areas of my greatest passions: writing, running, teaching. Also, I want to not just pursue these goals, but passionately pursue them. Not the lackadaisical, “I should write/run hard/research today, but…look, Pinterest!” type of “pursuit” I’ve done in the past. 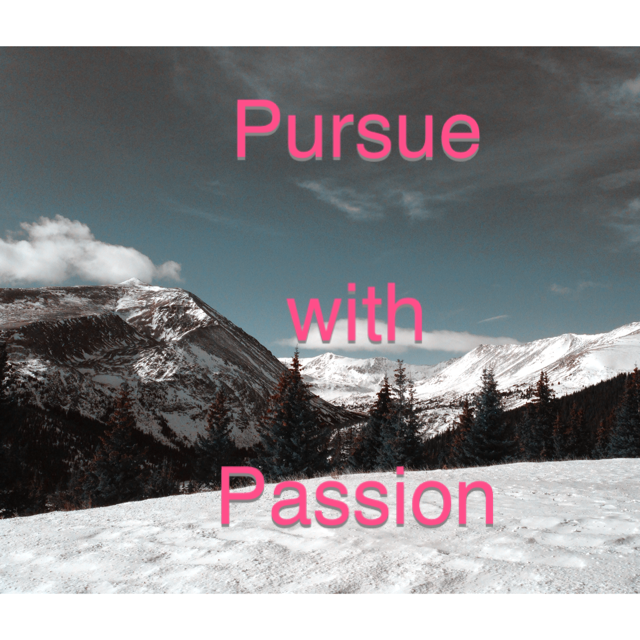 I decided to combine those words into a “focus phrase” for 2014: Pursue with Passion. This year, I won’t just think about trying to get professionally published; I’ll actively write and research. I won’t just dream about running a 3-hour marathon; I’ll run hard and fast (and recovery smartly). I won’t just complain about my digestive issues; I’ll experiment and research and pursue a solution. And I won’t just go to work every day and “try to do my best”; I’ll strive every single day to improve my teaching practice. In short, I will Pursue With Passion. What are your New Year’s goals/word(s)/resolutions? This is beautiful, as always! I think that is an awesome phrase for 2014! That is a great phrase! Hope to see you continue keeping the passion alive!